I found this idea on Pinterest months ago. It looked easy and cute, the two requirements that any craft must meet before I attempt it. The original post was adorable, but lacked specific instructions, which, if you come here often, you know that “exact” is in my top ten favorite words list. I did a bit of Googling and found more clear directions. Here’s how mine turned out. Not as cute as I had hoped, and it cost a bit more than I intended to spend, but once I got started, I had to finish it. The original blogger said she got all of her supplies at the dollar store. She must live in a larger town, because my dollar store didn’t have the foam wreath form. I had to buy it at Hobby Lobby at a much higher price. Also, I couldn’t find the rounded kind of form; mine had square sides. That was awkward for this project. I also wish I’d used more socks. I may go back and add more later. Another problem I encountered was the bow. The original blogger didn’t describe how she made a bow out of a sock! I’m not a bow maker, so I needed directions. I had to buy a bow at Walmart and trim the ribbons. Despite all of this, I forged ahead. I think it turned out okay, but it wasn’t as adorable as I’d expected. Here are the steps I used to make this wreath. You can also read more about making it HERE. A foam wreath form – with rounded edges, if possible. Christmas socks from the Dollar store. A bow, or ribbon (or extra socks) to make one if you know how. Cut the toe and heel off of socks, so that you have a tube that’s open on both ends. Slice through the wreath form with a knife in one place. Bunch socks around the wreath however you like. You may try to follow a pattern, or go random. It’s up to you! Very neat idea! I think it urned out cute! your wreath turned out adorable! I have this pinned to do (this year.. rolls eyes) .. I do hope to get to it this year! That is a cute idea! 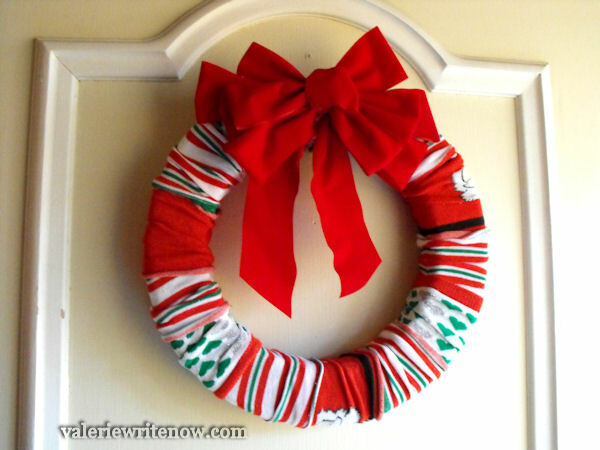 What size wreath form did you use? Where did you hang yours? I think it was an 8 in. form, but any size would work. It is on our front door. I've not tried it, but I've seen where you can use one of those noodles that you use in a swimming pool. (may be kinda hard to find this time of year, but oh well) Cut it to the size you want and then duct tape it to keep it together after you put the two ends together to make it round. Or in this case, put the socks on and then tape it and pull the socks back over the tape. Hope this makes sense. Nice wreath!